« Nightmares & Fairy Tales’ Serena Valentino weighs in on HEART OF A CORPSE! 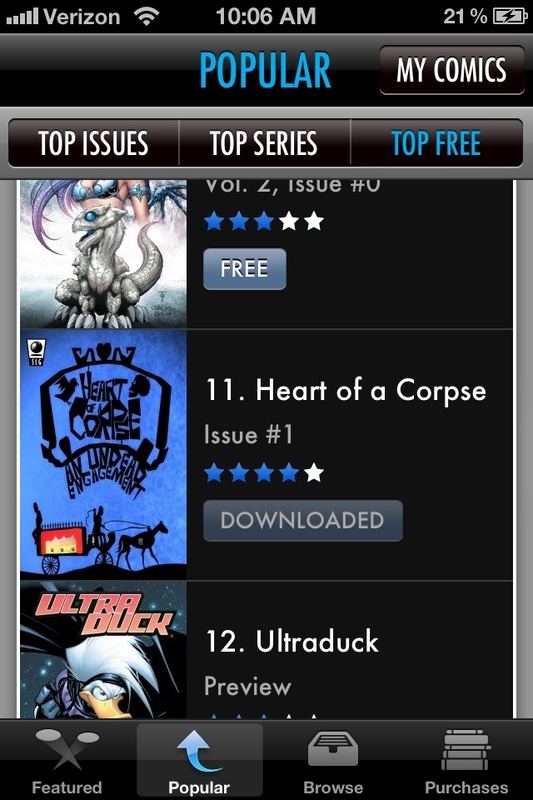 HEART OF A CORPSE Issue #1 is #11 on comiXology’s Top Free Comics! That’s right, comic fans! The first part of my graphic novel, HEART OF A CORPSE, has almost reached the top ten free comics on comiXology! Please help spread the word – and let’s get it to #1! The first part is free, and the second is a measly 99 cents! This entry was posted on February 21, 2012 at 10:03 am and is filed under comic book, Comics, Graphic Novel with tags comic book, comics, comixology, graphic novel, heart of a corpse, justin sane, slave labor graphics, slavelaborgraphics, slg. You can follow any responses to this entry through the RSS 2.0 feed. You can leave a response, or trackback from your own site.